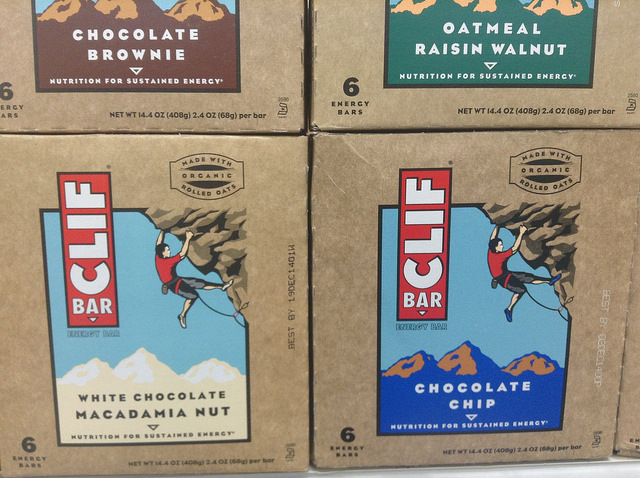 If you know what Clif Bars are, ProBars might look familiar to you. That’s because the packaging is similar, from the graphic logo to the size of the bar and even the packaging material. In fact, it’s sort of hard to tell what the difference may be between the two at all. Throw in the hundreds of other energy bars out there, and they all start to blend together. While I can’t speak for every energy bar, I can give my two cents on these two brands. There’s a website called www.wildbackpacker.com that helps compare energy bars by reviewing five criteria: carbohydrates, protein, calorie count, price tag, and taste test. So I decided to run both bars through the test and see what happened. I’ll start with the Blueberry Crisp Clif bar. I was actually (pleasantly) surprised with the taste of the ProBar: Fuel. First of all, you can see the ingredients in it: chia seeds, dried blueberries, cashews, and although there’s stuff added that you can’t see (as most energy bars do), it at least feels like you know what you’re eating. The ProBar (at least the one I had) was softer than the Clif Bar and tasted more natural. So it all comes back to personal preference. Both ProBar and Clif are pretty similar in terms of ingredients and price (although you get a better deal with Clif), and although the ProBar is less in calories, you also have to look at where those calories are coming from. Another thing to take into account is performance; if you’re using energy bars like me as a snack between classes, you might think differently of them than if you’re using them as energy before a workout. At the end of the day, you’ll probably be equally satisfied with Clif or ProBar. But if you ask me for my opinion, I’d pick the ProBar: Fuel.